Many of us have the incredible dream of strolling down an exotic sand beach with a metal detector and finding plenty of gold. But is it really as easy as it sounds? In the middle of the 18th century when the new settlers were desperate for finding gold, there was a huge need for an object that would help everybody to get wealthy. However, the first primitive metal detector designed by Alexander Graham Bell had nothing to do with gold. Actually, he invented a device to save the life of President James Garfield who was shot in the back. So, believe it or not, the first metal detector was designed especially to detect the bullet that was killing the president. Later on, Graham Fisher improved the already existing metal detector that Bell created and founded the Fisher Metal Detectors. They were using these devices after the two World Wars to find hidden bombs. In the ’50s the electrical engineer Charles Garret improved the metal detecting machines even more, and with the development of technology, we have the modern metal detectors that are still in use up to date. Before you even start swinging with the coil all over the beach of your choice, you better make sure that you’re allowed to do that. It really won’t be nice to find an expensive item on a beach where it’s forbidden by law to use a metal detector. Who wants to give away a priceless royal ring? A regular detector is good enough for beaches with dry send, but if you choose to go to a beach with wet sand than the rules of the game will slightly change and you would need a better detector. The reason for this is because the wet sand usually contains traces of iron and black sand which can deceive your device. The salty ocean water can also affect the sensors of your machine. However, the beach metal detecting is extremely productive and it won’t be too long before you find your first treasure. Don’t be ignorant and learn as much as you can about the nature of the tides. The first thing you should know is that there are two low and two high tides every day. A little bit of additional research on the exact hours of the tides that rule your beach is always useful. You will feel safer and more confident while on your treasure hunt. What you need to know is that the best time to take an action with your metal detector is at low tide. If you have spent an entire morning at one location and you still haven’t found one single thing, then you better move on instead of falling into despair. Get a grip and prepare yourself for the next day or even maybe the next beach. This is probably quite an obvious tip, but it’s definitely one of the most important ones. Make sure that you follow the high tide mark on the beach or if not visible, check out where the sunbathers place their towels. They never go too close to the water, so you shouldn’t go either. People who usually lose their belongings in the sand are the sun-starving ones, so stick close to their zone. I know, we all love wide empty sandy beaches and we don’t want to be disturbed. But think about it this way: Is it most probably to find valuables on an empty beach or some more popular spot? The answer, of course, is a crowded beach. Now, why a rocky beach? Because rock outcroppings trap coins, and other valuable objects more than the sand does and they’re not as deep underground. So, no matter what, if you see a rocky spot on your favorite beach, look there. It depends on your personal choice. If you choose to go in an hour where there is a lot of people staring at you and asking you questions, then go for it. But if you prefer to be left alone and avoid the crowds then you will probably feel better to go metal detecting in the evening. Anyway, if it’s your lucky day you will find the golden ring that you’ve been dreaming of since you were a kid, no matter what. Imagine spending hours walking down the beach with a nasty pair of headphones that make you anxious? I assure you that’s a very bad idea. If you want to create pleasant metal detecting memories then choose equipment that doesn’t bother any part of your body (especially your ears) and learn to connect the excitement with comfort. After all, beach metal detecting is something you chose to do, therefore you need to feel good while doing it. It sounds weird, but wouldn’t it be nice if you return the necklace to someone who you see is crying on the beach? I bet you agree with me. In case you find something worthy and there is no one around you screaming and digging into the sand, then you can go home happy and buy your friends a dinner. But in any other case, you should always give back other people’s belongings. You never know how big sentimental value they have. Let’s make it clear – beach metal detecting is not a joke and it’s not all about finding only coins and earrings. Actually, there are some cases throughout the years of brilliant metal detector finds. One of the world’s largest valuables is the 389.4-ounce golden nugget called the Boot of Cortez, discovered in Mexico in 1989. Another valuable worth mentioning is Santa Margarita Gold Chalice, found in Key West in Florida in 2008. The Golden Chalice was lost after a shipwreck in 1622. Gold Iron Age Necklaces were found in 2009 Scotland. Their approximate value is $2 million. There are hundreds of places around the world suitable for metal detecting and for some of them you don’t even need the permits. If you are a coin hunter like myself, then I will suggest that you check places like old torn down houses, abandoned swimming holes, old churches, and parks that nobody visits anymore. As for the beaches, Florida is quite a gem. Here are some of the best Florida beaches where you can find valuable coins by using your metal detector. Headphones are extremely important where you go on a metal detecting adventure. As mentioned above, don’t feel sorry to spend some extra cash and buy a good pair of headphones that won’t harm your ears. The professional headphones will assure you that you don’t miss not even one single alert coming from the sand. An absolute must! The metal detector will let you know when there’s something underneath your feet, but the pinpointer is the part that will lead you right to the buried treasure. You need to make sure that your digging tool is appropriate for the type of terrain you’re visiting. This is a tool that not all metal detecting enthusiasts use, but in my opinion, it’s definitely necessary if you find valuables deep under the ground. Another important item that should take a place between your metal detecting gadgets. It’s simple – you need a pouch to store all your valuable findings. Sand Scoop is a must if you’re planning to go treasure hunt on the beach. It will help you sift the sand and find your items easily. You can surely do it without this one, but having it will help you a lot. You’ll have all your equipment in one place and you’ll have lesser opportunities to lose it. You must bring rechargeable batteries on your treasure hunt. The reason is quite obvious – you don’t want your beach adventure to be spoiled just because of a pair of batteries, right? 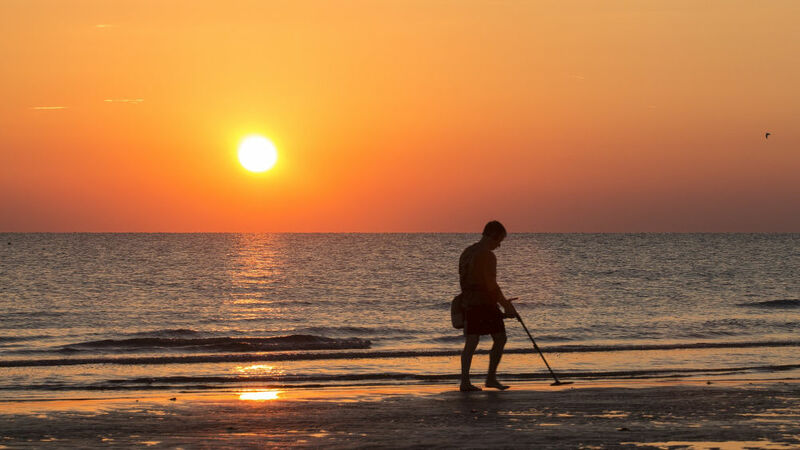 Metal detecting on the beach is an awesome hobby and for some of us, even more than that. Whatever the case may be, we must all agree that metal detecting on a beach is one of the most amusing activities to do. Plus, you never know when a regular beach day can turn into a rich day for you and your loved ones. Grab your metal detector and don’t forget to have fun. Good luck!